Neil Cotter and Adam Higgins have reported that former CEO of FAI John Delaney secured World Cup final tickets for one of the members of the Oireachtas sports committee, Fianna Fail TD Kevin O’Keeffe. The committee is scheduled to question Mr Delaney and other senior FAI members about FAI’s governance in April. 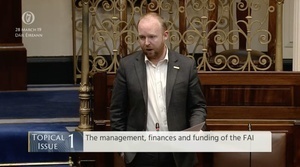 The report follows a separate report in The Sunday Times at the weekend in which Fine Gael TD Noel Rock claimed that he had been told that FAI had been briefing against him “including saying that he had sought complimentary tickets for Ireland’s game against Austria in Vienna in November 2016”. Mr Rock said he attended the match as a guest of the taoiseach Leo Varadkar, who was minister for social protection at the time and that he has never sought or received complimentary tickets from the FAI. 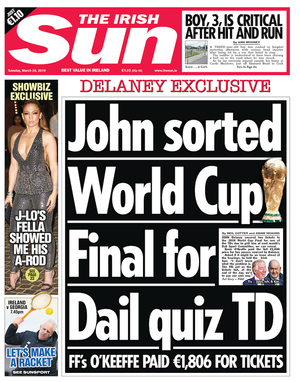 The Deputy Kevin O’Keeffe story comes after Deputy Noel Rock says the FAI were briefing against him after he called for Delaney’s departure. 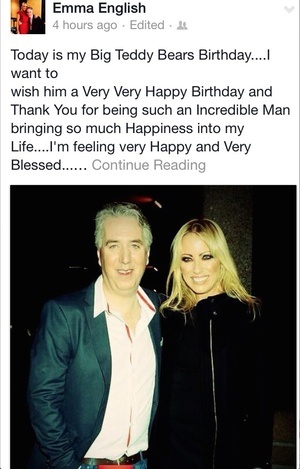 Noel thinks the FAI is suggesting he was only after complimentary tickets. Just how many members of the Oireachtas sports committee have had ticket dealings with the FAI? It’s beginning to whiff of sleaze. Posted in Misc and tagged complimentary tickets, FAI, John Delaney, Tickets at 11:13 am on March 26, 2019 by Bodger. There’s potentially far more to this story than is reported in the Sun. According to news reports at the time of the games in Moscow last year, the €903 face value [category one] tickets for the final were selling on the black market for “up to $105,000” (€90,000). That’s one hell of a potential benefit and Deputy O’Keeffe got not one but two tickets. It’s a bit rich for him to say today that he paid face value and not address the massive premium that existed in the secondary market for those tickets. Ye want to know why this keeps happening? that response from O’Keefe sums up Fianna Fail (and most irish politicians) perfectly. “How (else) would I get a World Cup final ticket?” .. the two things he just absolutely does not see is (1) they’re not rightfully his, he doesn’t have some entitlement to get tickets. Tickets that could have been given to someone either more deserving, or someone who would put them to use somehow to the betterment of irish sport. not just some FF TD who just, wants, to go. (2) how else? so ill-gotten means aren’t off the table, if corruption is the only way, then he will do that. this quote was probably the only honest thing an irish politician has said in years. no question for you, as you’ve demostrated you do NOT get it at all. Did he, this background Politican go and sell them on in the bootleg tout market? 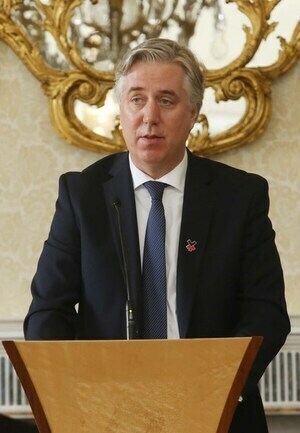 Did the then CEO of the FAI seek to influence that Politican ? Where the eff are Deloittes? How come an employee had to sub the FAI to make payroll? How come the full details regarding this employee director’s full emoluments/ renumeration package was not fully disclosed? Can I ask the CEO to get me WC final tickets and pay face value for them when they’re sold out? And if so how do I contact him? Is that what the lucky recipient did? Sell them on for a 100k in dirty money? Is that the Other Assurance Service Deloittes provided – testing how the FAI distribute and account for high AML/CTF risk tickets? Will I spray on some perfume and light some fancy ridiculously priced candles?